Instagram is introducing a feature that will blur sensitive material, the social media firm announced today. The app is adding a screen to go over sensitive content, blurring out photos and video that audiences may find "offensive or disturbing." Instagram's censor filter applies to posts that don't violate the Facebook-owned social network's terms of service, but have been reported by the community and confirmed as sensitive by a member of Instagram's review team. The screen can be removed with a single tap, allowing casual browsers to avoid coming across certain material with minimal intrusion to those who subscribe to such content. 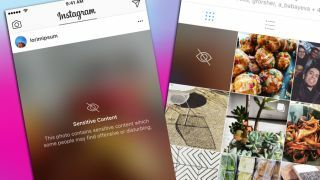 While it's easy to assume the feature is for covering up sexually explicit posts, Instagram says the blurring is geared primarily towards keeping users from inadvertently viewing violent content from, for example, organizations exposing animal abuse or human strife, according to The Verge. Instagram is also adding a must-have security feature for any app worth its salt: two-factor authentication. By requiring a second form of verification — in this case, a single-use code used during each login — users will have an easier time protecting their accounts and keeping scammers at bay. Two-factor authentication is accessible on Instagram's options menu, found on your profile page behind a gear-shaped icon.